Trick or treating was so fun last night! Rowan skipped her second nap of the day so she was pretty tired but she still had a good time. We walked around my brother-in-law's neighborhood since it's much more Halloween friendly and it was fun seeing my niece and nephews all dressed up and excited to have Rowan around to trick or treat with. How was your Halloween night? love the costumes!! Rowan's owl is AMAZING! where did you get it? Very Beautiful and sweet pics, sounds like you had a great time! what an adorable little owl! Did you make her costume? You guys looked AMAZING!! Such a fun idea! Love your family costumes. Looks like a great time! 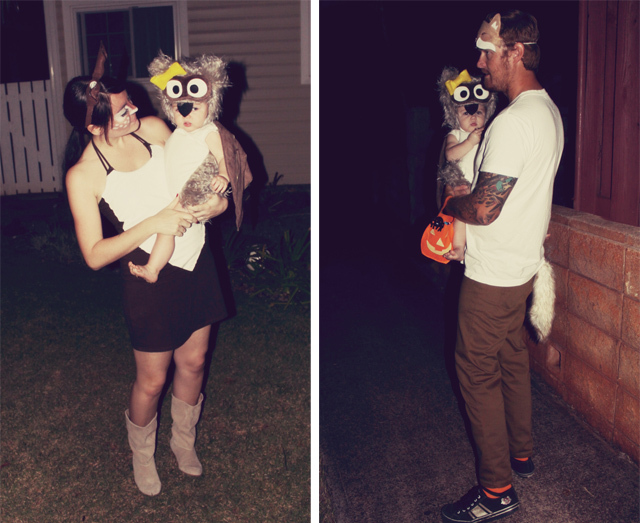 what a cute little woodland creature family! Ours was lovely. Love the woodland family! Love all the costumes! Your makeup is brilliant and her little owl suit is too sweet. Her costume is adorable and I love your make-up. Aww! I was a deer too! Wish we could have been lil fawns together.